James Morrow is a novelist with a reputation for satirising organised religion, but his new book Shambling Towards Hiroshima mashes up the original Godzilla movies with the nuclear attacks on Japan which ended the Second World War. Given the opportunity to ask the man some questions, the first thing that leapt to my mind was to enquire as to why Morrow had decided to write about the Hiroshima and Nagasaki bombings, and why he’d choose to mix in monster movies as a subtheme – despite the potential risk of being accused of irreverence or outright frivolity, or of resurrecting dead issues. It is Futurismic‘s very great privilege to play post to his response. Saint Thomas Aquinas famously remarked, “To one who has faith, no explanation is necessary. To one without faith, no explanation is possible.” The same principle applies to classic American and Japanese monster movies. To one who loves this sort of cinema, no explanation is necessary. To one who does not, no explanation is possible. As a school-age kid living in a sterile Philadelphia suburb in the late fifties, the culture of old horror films spoke to me in much the same way that God speaks to the theistically inclined. Thanks to my parents’ crummy little black-and-white television, plus my subscription to Forrest J Ackerman’s Famous Monsters of Filmland, I routinely enjoyed revelations from that wondrous and exotic celluloid realm. To see a chopped-up, truncated print of King Kong revived on late-afternoon TV was an authentically religious experience for me, and any broadcast of the 1956 Godzilla wasn’t far behind. So I went home and outlined a novel called What Rough Beast, which I never wrote. According to my notes, Godzilla travels to Washington DC in 1995 to inspect the controversial Enola Gay exhibition at the Smithsonian Institute, his intention being to incinerate the city unless the curators prove willing to acknowledge certain political, military, and human truths about Hiroshima. The premise drew its energy not only from kaiju eiga but also from a book I was reading at the time, Robert Jay Lifton and Greg Mitchell’s Hiroshima in America, an impassioned revisionist critique of the decision to drop the bomb. These were familiar waters for me. In the mid-eighties I’d published This Is the Way the World Ends, a caustic fantasy savaging the Reagan Administration’s cavalier attitude toward weapons of mass destruction. The novel turns on “the unadmitted,” a hypothetical race of humans whose passports to existence are canceled when their would-be ancestors exterminate themselves through thermonuclear war. Upon receiving a one-year lease on life down in Antarctica, the unadmitted resolve to round up the perpetrators of Armageddon and put them on trial for “crimes against humanity” under the Nuremberg precedent. After noodling with What Rough Beast for several months, I abandoned the project on aesthetic grounds. To use the historical facts of the Smithsonian exhibition in such a bald and moralistic way, I decided, would entail too few novelistic virtues and too many finger-wagging harangues. When Jacob Weisman invited me to contribute a short book to the Tachyon list, I rethought the whole Godzilla thing from top to bottom, eventually hitting on the notion of a secret biological-weapons initiative overseen by the Navy in tandem with the Army’s Manhattan Project. The Knickerbocker Project reaches its climax in 1945, bringing forth a generation of giant mutant amphibious bipedal fire-breathing iguanas just in time to influence – perhaps – the outcome of the Pacific War. While the Naval high command is eager to deploy the new weapon strategically, the Knickerbocker scientists want to demonstrate the deadly lizards to a committee of Emperor Hirohito’s confidants. The scientists believe that if they can get a dwarf form of the monsters to destroy a scale model of Shirazuka – a hypothetical Japanese city – in the presence of the delegation, then these advisors might try to talk Hirohito into accepting the unconditional surrender terms of the Potsdam Proclamation. Alas, the dwarf behemoths prove much too docile, so the scientists have to hire a horror-movie actor, Syms Thorley, to don a rubber “Gorgantis” suit and wreck the miniature Shirazuka before the eyes of the visiting dignitaries. Shambling Towards Hiroshima is Syms’s story from start to finish. This conscientious, cynical, world-weary actor, loosely based on Lon Chaney, Jr., must give the performance of his life. If he can raze Shirazuka with convincing ferocity, then the Pacific War could very well end without a bloodbath. If Syms screws up his assignment, Truman will have to choose among three woeful options: invading the Japanese mainland, unleashing the city-stomping monsters, or dropping atomic bombs on civilian targets. 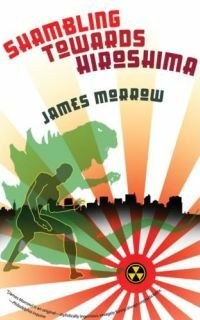 My essential aim in crafting Shambling Towards Hiroshima was to offer readers an amusing satiric tribute to 1940’s horror movies combined with an affectionate celebration of the kaiju eiga phenomenon. As with This Is the Way the World Ends, though, I also wanted to compose a lament for the victims – both real and potential – of nuclear war. This loftier agenda found me devising a framing story in which Syms Thorley, now retired from the silver screen, attends a monster-movie convention in Baltimore. There he meets a Japanese fan whose aunt was one of the hibakusha, the “explosion-affected persons” – victims of the atomic bombs. This earnest young man tells Syms all about the horrors his aunt witnessed in Hiroshima on August 6, 1945. Miraculously, the original Gojira of 1954 – not to be confused with the Raymond Burr re-edit I saw on Philadelphia television – manages to have it both ways. On one level, of course, Ishiro Honda’s low-budget masterpiece is a fun and engaging monster movie. And yet the scenes dramatizing the denouement of Gojira’s attack on Tokyo – particularly the tableaux set in hospital wards – include images that deliberately evoke documentary footage of the aftermath of the Hiroshima and Nagasaki bombings. Rent the beautiful Toho DVD restoration, and you’ll see what I mean. For all the nuttiness of its central premise, I hoped that Shambling Towards Hiroshima might contribute to the ongoing debate – a conversation that must never end – about Harry Truman’s decision to wage nuclear war on Japan. Beyond the Lifton and Mitchell book, I perused Tsuyoshi Hasegawa’s recent scholarly tome, Racing the Enemy: Stalin, Truman, and the Surrender of Japan. And I looked at some primary sources available on the Internet, including accounts of the discussions held by the Interim Committee of the Manhattan Project. I ended up concluding that, when we argue about whether Harry Truman should have ordered the Hiroshima raid, we are perhaps addressing the wrong issue. Rather, I think we should be asking three other questions. First, given the horror and remorse that the obliteration of Hiroshima had surely instilled in Emperor Hirohito, was it necessary to hit Nagasaki immediately afterwards? Some historians are troubled that General Leslie Groves systematically arranged for the second atomic attack to occur before Tokyo could formulate a coherent response to the first one. Second, how essential was it to define the “unconditional surrender” of Japan in the most draconian terms imaginable? From the enemy perspective, the Potsdam Proclamation clearly allowed for Emperor Hirohito to be tried and executed as a war criminal, an intolerable thought for the Japanese – and surely one reason for Tokyo’s maddeningly equivocal reaction to the ultimatum. And yet, ironically, after Hirohito finally demanded that his generals capitulate, there was evidently no sentiment among the Allies to arrest him. Indeed, McArthur allowed the Emperor to remain the titular head of his nation, a gesture that proved essential for shutting down the tattered but fanatical remnants of Japan’s once mighty military machine. Third, how necessary was it, both to immediate American interests and to the welfare of humankind in general, that the Pacific War end with minimal assistance from Stalin? Let’s not forget that, the day before the Nagasaki attack, the Soviet Government officially declared war on Japan. It seems reasonable to conclude that, even without the atomic-bomb factor, the Japanese would have ultimately surrendered in consequence of massive Soviet involvement – a situation that Truman could not countenance, given his understandable desire to curtail Stalin’s postwar influence in the Far East. I’m by no means trained historian, but I am pretty sure that those are the relevant problems. James Morrow can be found online at jamesmorrow.net.